Welcome to the Generic Universal RolePlaying System! With GURPS, you can be anyone you want – an elf hero fighting for the forces of good, a shadowy femme fatale on a deep-cover mission, a futuristic swashbuckler carving up foes with a force sword in his hand and a beautiful woman by his side . . . or literally anything else! Thanks to its flexibility, quality writing, and ease of use, GURPS has been the premiere universal roleplaying game for over three decades! More than 1,500,000 copies are in print – not counting foreign editions. GURPS Lite, a 32-page distillation of the basic GURPS rules, is available for free download. We also have dozens of GURPS adventures and e-books available on Warehouse 23. Whatever your favorite roleplaying genre might be, GURPS can handle it. More about GURPS . . . Here are the last 15 GURPS supplements (including reprints and new editions) we have released, either in print or electronically. Click on a cover to go to that product's page. Subscribe to the GURPS News mailing list by going here and clicking on "Join Group" or "Subscribe to this group" or by rss. I am writing this on the last day of March – mostly because it covers March, but also because I know that if it goes live on April 1, nobody will take it seriously! Perhaps it's unwise to take anything I write too seriously, but I'm mostly not that crazy. Mostly. March was a good month for progress on GURPS-related publications (as you'll see in Upcoming Plans), but we had too much going on to manage a new release. 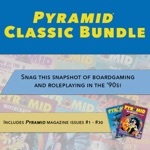 As I noted in the previous update, we do plan to use the resources freed up by the closure of Pyramid to produce more GURPS content, but that won't be an overnight transition. For instance, we devoted most of our energies over the past month to the Dungeon Fantasy Monsters 2 & Game Reprint Kickstarter – which was funded with time to spare, thank you very much! Thanks again for your patience. We did issue several reprints via print-on-demand (POD), however: GURPS Japan, GURPS Middle Ages 1, and GURPS Russia. To see everything available through this channel, visit the GURPS On Demand page. Don't forget that these aren't new editions, just new printings. We have a lot in the works . . . that's partly why it's taking us so long to crank out new stuff. Here are some teasers about what's coming up. Please remember that these are strictly guesses (if informed ones), so the order may change without notice and actual dates are unknown even to me. The Pyramid Dungeon Collection has art, and the PDF has passed review. It is in the running to become an April offering. GURPS Dungeon Fantasy 20, by Yours Truly, is also through the art and production-review processes, and in contention for April. Dungeon Fantasy Monsters 2 is back in production for length adjustment and to receive a cover. GURPS Powers: Totems and Nature Spirits, by Rory Fansler, is with me for editing. GURPS Monster Hunters: Power-Ups 1, by Christopher Rice, is in (indeed, almost through) playtesting. Something for GURPS Social Engineering, by Kelly Pedersen. Then another tool in the box for GURPS High-Tech, by Bill Stoddard. And after that, the next GURPS Disasters manuscript, by James Howard. First drafts in the GURPS Sorcery and GURPS Vehicles series await editorial review. The revised first draft of a longer project is in house, too. We are discussing how to proceed with that. As well, we have six items in the design stage, plus a few that are on hold for the moment but not forever. If you want the weekly blow-by-blow, or crave leaks and clues, the GURPS thread in my blog gets updated every Friday. 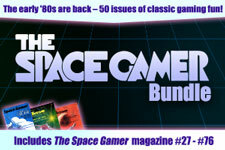 We also sell GURPS re-releases in PDF form on DriveThruRPG. To see what's available – newest products first – click on this link. We have a lot to review, playtest, and edit . . . but sooner or later we'll get through it all, and then we'll need more! If you want to write for us, now would be an excellent time to read and absorb the Submission Guidelines, GURPS formatting guide, and GURPS WYSIWYG template. Once all that makes sense to you, go to the Warehouse 23 Digital Wish List (updated November 30, 2018) and Warehouse 23 Wish List for GURPS (updated November 30, 2018) to learn what we're looking for. Please understand that without Pyramid as an entry point, we must insist that writers new to SJ Games stick to the titles solicited on those pages. Thank you!